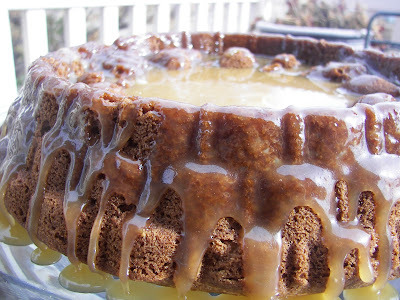 This is the Caramel Draped Applesauce Pear cake that I made for Sunday Dinner. I actually made two of them on Saturday; I am taking one to a funeral luncheon today. The cake has a drippy, gooey, yummy caramel sauce which covers a spicy cake. I had seen a cake made using the Nordic Ware Harvest Basket pan (sometimes called Fancy Marianne) pan on a Foodie Friday entry. Soon after that, I found the pan on clearance; you can use any cake pan and then adjust the cooking time. I used the recipe included on the back of the cake pan, with a few alterations. I like that the cake itself is made with vegetable oil I know some of my family members were hoping for cake for breakfast; sorry, it's all gone. 1 fresh pear, peeled, chopped and mashed -- I used the equivalent with a canned pear. Note: I didn't have any rum, so I made the cake more of a spice cake. I added 1 teaspoon of cinnamon, 1/4 teaspoon cloves, 1/4 teaspoon nutmeg. Preheat oven to 350 degrees. Grease and flour pan. I use Baker's Joy with detailed Nordic Ware pans and have no problem with the cake releasing from the pan. In large bowl, combine all cake ingredients; blend two minutes on medium speed, scraping bowl often. Pour batter into prepared pan. Bake about 40 minutes or until toothpick inserted comes out clean. Cool 10 minutes in pan; invert onto cooling rack. Combine all sauce ingredients in heavy saucepan. Bring to a boil over medium heat, whisking occasionally. Cover and continue to boil for 1 minute. Uncover and boil for 3 to 4 minutes without stirring. Cool slightly before drizzling over warm cake. Serve cake warm or cooled with seasonal fruit and whipped cream. We served the cake cold but with the warm yummy, drippy caramel. We didn't serve with fruit or whipped cream, but I am sure it would have been great with some sliced pears. The basket cake pan I used was designed to hold fruit on the top. Thank you for dropping by Red Couch Recipes today! I know you will love this cake. anything "draped" in carmel has to be good!! You had me at gooey! That sauce will definitely be on a cake here soon. Wow! This looks fabulous! That caramel topping makes it perfect! I'm entertaining a vision of floating in a sailboat in the middle of your cake with a little spoon, Joni. I just looks heavenly! My family would like this too. Thanks for passing it along. That certainly is "draped" and I love that part about it the best. This looks so lucious. I could use a big piece with lots of caramel for breakfast right about now - I like my breakfast around 10:30 or 11:00. I bet the family loved this one. Do they appreciate you enough?!!! I don't think I have ever seem a more tempting dessert! It is too pretty to cut! I love the caramel/pear combination. this almost looks too good to eat! This cake looks soooooooooo decadent. I'm passing this recipe on to my sister who can't resist anything caramel. Thanks for sharing. You had me at "draped in caramel"! OMG, this looks FABULOUS! I am a caramel freak! I love pears. This sounds delectable! 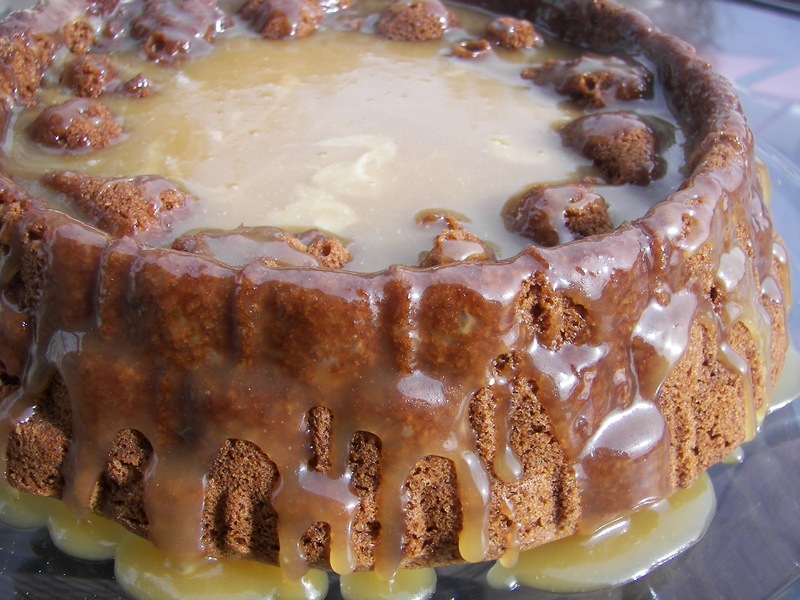 The dripping caramel makes the cake so wonderful! what a beautiful cake...the recipe looks yummy too--perfect for fall. yum! I have to agree with Happier Than a Pig In The Mud...I bet it would be great alone but with coffee I'm sold! I believe I have just died and gone to heaven. That cake looks amazing. Can'twait to try it!! good mercy! that looks wonderful! Wow! Your pictures look like they came straight out of a magazine. Yum. Your lovely, rich cake looks like a pool of caramel, and I'm ready to dive in! Oh my.... this looks delicious! That looks incredible ... I fear I'd eat the whole thing. I think my mom made a spice cake like this, but without the caramel. Your version looks delish! How do you do this week after week...this cake looks beautiful and I can close my eyes and imagine the taste...heavenly. I love pears. This cake looks amazing.